With OverDrive Media Console for Mac, Sutherland Shire Libraries members who use Apple Macintosh computers can now download OverDrive MP3 Audiobooks via our Digital Downloads service. The Media Console's built-in Burn Wizard can be used to burn MP3 Audiobooks to CD, and the Transfer Wizard allows quick and easy transfer to Apple® devices (iPods and iPhones). MP3 audiobooks are a relatively new addition to the OverDrive service and therefore they make up a small proportion of the total collection of our Digital Downloads, of which most are older works such as Alice in Wonderland (most of the MP3 files are out of coyright as the MP3 format does not support Digital Rights Management like Windows Media files). You can see the full list of MP3 downloads we have available or read more about OverDrive MP3 audiobooks on the Digital Downloads web site. 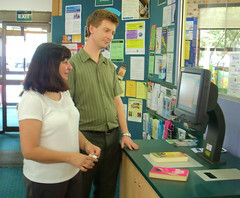 First Self Check Stations Installed, originally uploaded by Sutherland Shire Libraries. Sutherland Library is getting back in to some sort of order. 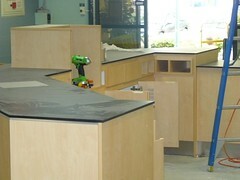 Our first two Self Check Stations are installed and the rest are going in today. That leaves some loose ends to tidy up tomorrow before we re-open on Thursday. We look forward to seeing you all then and helping you check out your own loans. For those who live in the southern part of the shire, there have been a few changes at Engadine Library. Have you seen Engadine's new self-checkout machines? At the end of October, Engadine library was closed for a few days so that state of the art RFID (Radio Frequency Identification) technology could be installed. This means that each item in the library is now 'tagged' and these tags can be read by devices that use radio signals to communicate with the item. What does this mean for you? Well, for a start, it means that our two new self-checkout machines are a lot easier to operate than our old one. Two big advantages of our new machines is that they will check out audio visual items as well as books (previously you had to take any videos, cds, etc to the desk) and you can now check out multiple items simultaneously. Also with these machines you can renew any loans that aren’t overdue and check to see if you have any fees owing. We are encouraging everyone to use the new self check stations and of course we will be here to show you how they work and help you if you have any problems. Come and say hello next time you're in. So Why is the Library Closed? What's been happening since we closed the doors at Sutherland Library? In a word, lots! Most of the Library has been thrown into chaos as the building work associated with the introduction of RFID is taking place. 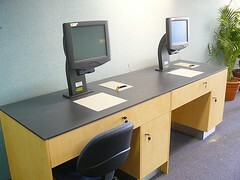 New Circulation Desk, originally uploaded by Sutherland Shire Libraries. We are introducing a number of self check stations and as a result the main circulation desk has been redesigned - you can see a sneak peak in the photo. We've also taken the opportunity to re-carpet much of the Library. You can have a look at some more photos of what we've been up to on Flickr. What a great opportunity to come in and check out a very different read! Borrow a Living Book for a 30 minute talk and discover what life is like from another angle. Living Books are able to take their story wherever you want them to go, just ask a question and see where it leads. Driven to Inspire – EmpowermentThis Book has many facets. Having rehabilitated himself after a terrible car accident at 17, he went to university and achieved a Mathematics Degree. During his rehabilitation he came to know God and feels he has been personally empowered by Him to strive to inspire others to work toward the common good on many global issues which require action. He has been a consumer of mental health services for a number of years, and he has written and published two books which are part poetical and part biographical Writing has been a cathartic tool for him. Did you know there was an abbey at Jamberoo? Why does it need Oblates, or do the Oblates need it? In many ways society compartmentalises spirituality, one is labelled as Christian, Buddhist, Islamic and the general expectation is that once one has chosen a name for their spirituality, then the tenets of others are passed over. Why then would a Christian Oblate live in Hindu and Buddhist ashrams whilst personally investigating spiritual traditions from around the world? This Book has her own answers to these questions and is willing to share her experiences with you. What was it like to be young and sporty in Bondi during the 60’s? Working out what to do in life is difficult. Discover how one person made their passion, not just a job but a lifestyle that has served them a lifetime. Squash provided this Book the opportunity to be his own boss, create professional networks and gain recognition in his area of expertise as well as develop lifelong friendships. Community support structures have also been a feature of this sporting life in working to promote diabetes awareness and management within a sporting lifestyle.